Long before I had this blog, I was writing reviews at www.BoardGameGeek.com. For the sake of completeness, I am now gradually porting across all those reviews. Not only does it enable me to keep track of my collection and what I have reviewed, it also allows me to update my blog more regularly without putting in any real effort. You know... I'm lazy. This is a rather less than glowing review for A Touch of Evil: The Supernatural Game, which I first published in April 2009. I've edited it, and slightly updated a small amount of content. Each hero in turn rolls a die, and then moves up to the number of spaces indicated on the die. Once on a space, the hero can perform certain actions such as pick up investigation tokens (which act in an abstract way to represent money, knowledge, clues, etc. ), draw a card (sometimes mandatory), or pay investigation tokens to buy items, buy a card that tells you where the villain is hiding (called a lair card), or pay to find out the secrets of a town elder. The town elders are one of the most interesting aspects of the game, as you can ask some of them to help you fight the villain, but each one has a secret. Some secrets are bad, some are good. You need to figure out which elders you can trust to take on a fight, and which ones you want to leave back at town. Once all the heroes have moved, the villain acts. This is represented by drawing a card and following the instructions on it. Okay, not quite on to the review. Before I get there, I want to say something about the theme of this game. This is not a game about Hammer Horror style Gothic horror. This is a game about Tim Burton’s movie, Sleepy Hollow. I’m not stupid, and I know that Tim Burton’s film is a love poem to lots of horror conventions, and therefore it is possible that a game that is also a love poem to horror conventions will contain similarities to that film; but really, everything about this game shouts Sleepy Hollow, and very little of it shouts Hammer. The time period is right (early 1800ish). 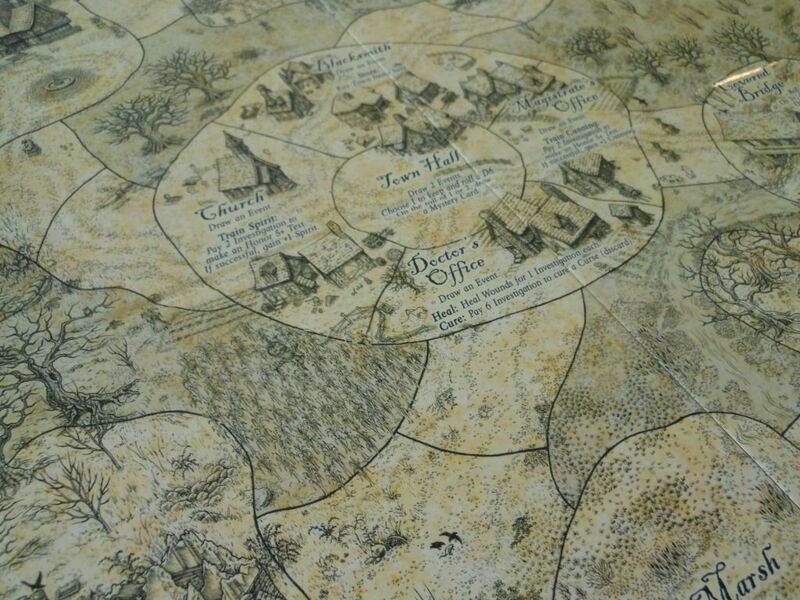 The locations in the game are all important locations in the film: a windmill, a covered bridge, a wood, a manor house, a ruin. One of the bad guys is the headless horseman. Another bad guy is a scarecrow (tenuous, but scarecrows are a big part of the movie, and appear in several key scenes). The whole plot: Investigators from out of town turn up to rid the town of an evil presence. And the clincher: The six town elders all have the exact same professions as the six potential victims/potential killers in the film. Okay, you could argue that the professions of the town elders are simply reflecting the people who would have been most important in any colonial American town during this period, but even so, it all seems a bit too much of a coincidence... Oh, and in the film, every one of the elders has a secret. There’s more: Similar characters, similar names, similar events, but I won’t go on. This is a review, not a soap box, after all... Now, the fact I believe this is Sleepy Hollow: The Game isn't exactly a bad thing. I love the film, and therefore I enjoy the theme of this game, but it does cause certain issues. First of all, the setting means that certain classic horror villains just won't seem right. I think the designers have already acknowledged this by their choice of villain characters in the game (and by the way, am I the only person who thinks calling the monsters "villains" makes them sound like something out of Scooby Doo? ): The villains are a werewolf, a headless horseman, a vampire, and... a scarecrow. A mummy wouldn't seem right shambling around this town, and neither would a Frankenstein's monster or a voodoo priest summoning zombies. It's not a massive issue, but it makes the game seem less generic. In age old tradition, I’ll start by talking about the components. All the tokens and cards are thick and glossy and everything is of a very high standard in that regard, but I do have serious issues with a good proportion of the bits. Not issues with the quality, which is hard to fault, but issues with the functionality. Straight out of the box, all the cards are stuck together, and I found it necessary to go through each deck to prise the cards apart. I believe talc can help prevent it, but even after a few shuffles, cards will still stick to each other. Not a deal breaker, but pretty annoying. Cards from the four different locations in the game. 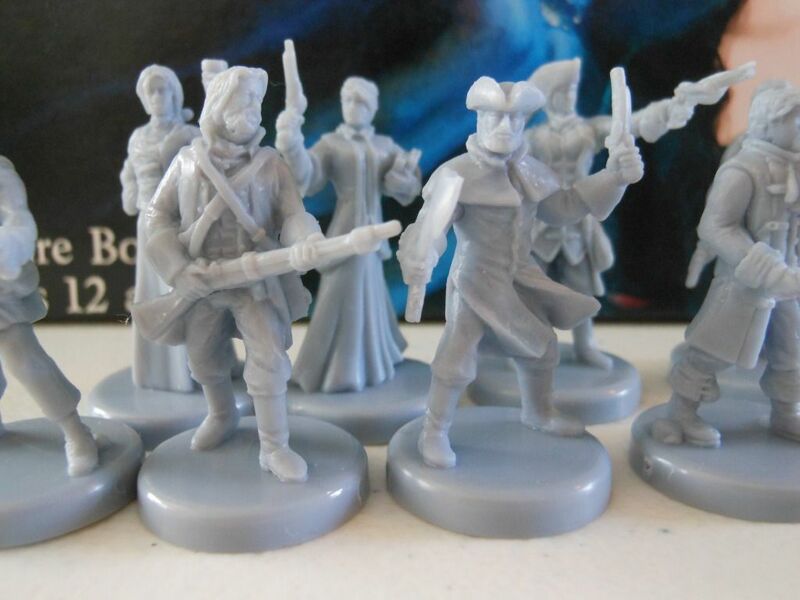 Much, much worse is the problem I have with the tokens: They’re double sided! This may not seem like a problem, but it really is. For example, during the course of the game you can acquire additional statistics for your hero (extra combat, honour, etc). Each bonus is represented by a little token. So, I put a few tokens on my player board that say +1 combat and a few that say +1 honour, but during the game... the board gets knocked, sending the tokens flying. I quickly pick them up, but... these tokens that say +1 combat say +1 honour on the back. Now, did I have 3 combat and 2 honour? 3 honour and 2 combat? I can’t remember. This is stupid! Okay, you will probably remember how the tokens were allocated, but as the whole point of the tokens is so you don’t HAVE to remember. It’s a pain. Monster tokens also suffer from being double-sided (a different monster each side). This is a pain for a completely different reason. 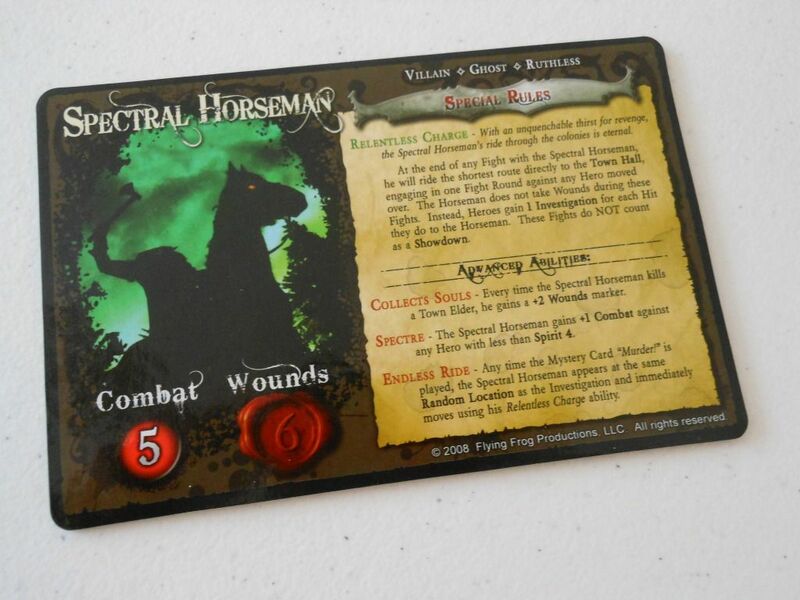 It means that, unlike in one of my favourite games, Arkham Horror, the special powers for the creatures cannot be printed on the back of the token. Every time you fight a monster you have to refer to a chart. A chart! It’s like playing Warhammer Quest 15 years ago all over again. Each villain in the game has its own chart, and every time you have to put a monster on the board, you have to roll on the chart. This is nice in one way, as it means each villain has its own set of monster tokens, and this makes each game feel a little different; but it is so much easier being able to randomly draw a tile from a pool rather than rolling a die, referring to a chart, then finding the right token, and then referring to the chart again to figure out what special rules affect that type of monster. It just feels so... old fashioned. Funnily enough, in a game where so many things are double-sided, the villain reference sheets aren’t. They cram the basic AND advanced rules for each villain onto one side of the card rather than having one side for the basic rules and one side for advanced. This just seems lazy. I don’t like the hero character sheets either. There is no space to put bonus counters, so once you have amassed a few +1 tokens for combat, cunning, etc., it can get a bit messy. 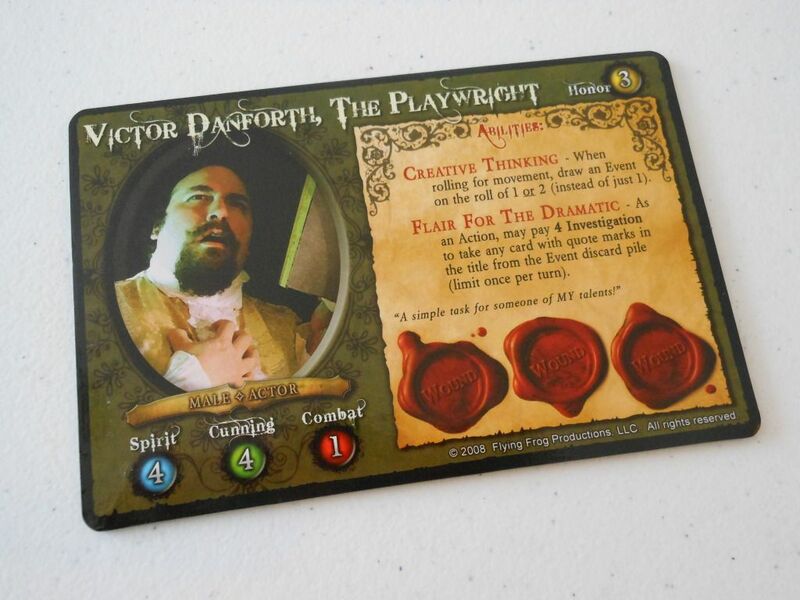 Victor Danforth - one of the investigators. The character sheets could have made use of sliders or something to show adjustments in statistics. Also, the sheets don’t make it easy to keep track of your cards. Anyone who has seen the Fury of Dracula character sheets will know they are laid out to indicate how many "spaces" you have left to hold items. This is not the case in A Touch of Evil, and again, it’s just a bit messy keeping track of everything. The character pieces are very nicely sculpted, but there is little to distinguish them apart from a distance. Worse, their stances are not reflected on their images on the relevant character sheets, so it is not immediately apparent which figure goes with which character sheet. The miniatures from A Touch of Evil. The artwork also causes concern. When I thought this was a B-movie / Hammer Horror type of game, the artwork seemed quite fitting (although it would have been better in black-and-white); but once I started to feel like it was a Sleepy Hollow type of game, suddenly the graphics seemed all wrong for the mood. Still, I appreciate Flying Frog Productions "branding" their games in this way, and I can live with that. My favourite graphic is on the "first player" token - the FF logo. This is a theme-breaker for sure, as a frog has nothing to do with the game; but it’s a great piece of artwork. I hope the frog gets his own game one day. It’s really small. I didn’t think this was a problem until I realised the shadow track (a thing that runs out as the game progresses and counts as a win for the villain if it runs out completely) was printed on a separate piece of card. This could have been printed on the board if the board had been bigger. More of a concern is the number of spaces on the board. A character rolling a 6 for movement who also has a horse (+1 move) can almost get from one corner of the board to the opposite far corner in one turn. The board's layout seems wrong. All of the relatively safe town spaces give you a free useful event card plus another useful special power. That being the case, why would I hurry to head out to a dangerous location? And why would I ever stop in the marsh or the field, where there is a chance of an extra mystery (bad card) being played that will hurt me? In fact, the first few turns of the game will involve all of the heroes staying in the village in order to build up powers before venturing somewhere dangerous. This is incredibly dull. Even if you are on a town space and intend to go to a dangerous corner location you may not get the chance because the spaces on the way to the corner location are "dead" spaces where nothing happens. That means if you don't roll at least a three to get from the town to the corner location in one turn, there is no point leaving the village: Your choice in this situation is to finish your turn on an empty path space where nothing happens, or dawdle in the town for a turn picking up bonus event cards. There is no incentive to head out questing at all. I have actually been forcing myself to play more aggressively recently, heading to corners straight away to encourage more exciting play. The net result is I end up losing to the players who take their time building up cards in town. If I play the waiting game, I can win easily every time. 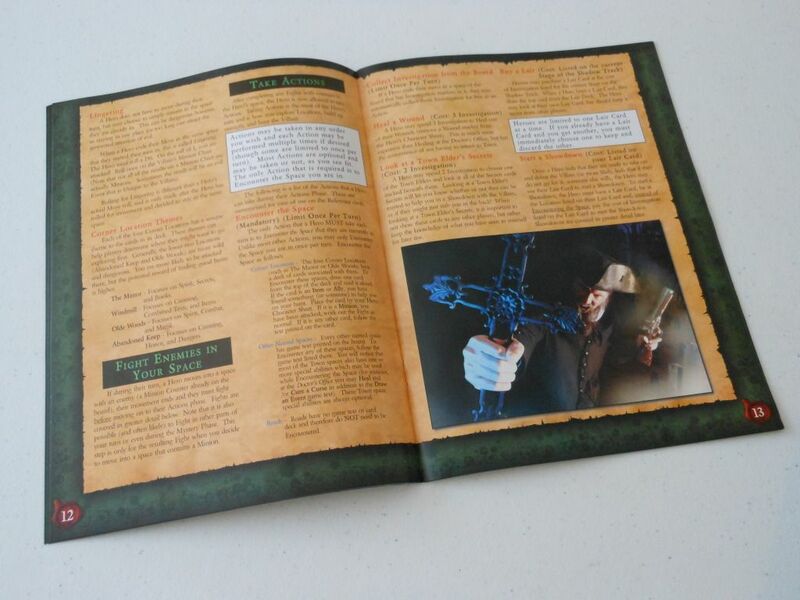 Two spaces on the board allow you to pay two investigation tokens to get extra cunning or spirit, and as every investigator starts with two investigation tokens, it makes sense to use your first turn to try and pick up some cunning or spirit if that particular stat is low for your character. This highlights a ridiculous disparity between some of the characters. For example, Karl the soldier is very strong (4 combat) and has high honour (5), but has low spirit and cunning. He starts the game in the town hall, one space away from a space that allows him to pay two investigation and roll dice equal to his honour (5!) to get an extra spirit or cunning. Why wouldn’t you do that on your first turn? It makes a mockery of giving the character poor starting stats. Simply put, the village allows you to build up powers and stats too quickly. As an example, in our first game, my wife was Katarina, who is already pretty tough (4 wounds, good all-round stats, high honour). She rolled a one for movement (gaining a free event card for doing so), moved one space to the church (getting another event card), and then paid her starting two investigation to get an extra spirit. By the end of the first turn, she had +1 spirit, an extra wound (from an event), and a card that put two investigation tokens on every named location. We both subsequently spent a few turns just walking around the village picking up the tokens and trading them for power ups and getting tons of event cards in the process. The investigation tokens are a cool idea. This is a really good element of the game. By using these tokens in an abstract way, there is no need to keep track of lots of different things such as cash and clues and this really simplifies the game. However, the investigation is too easy to get, and after a while the tokens become worthless. 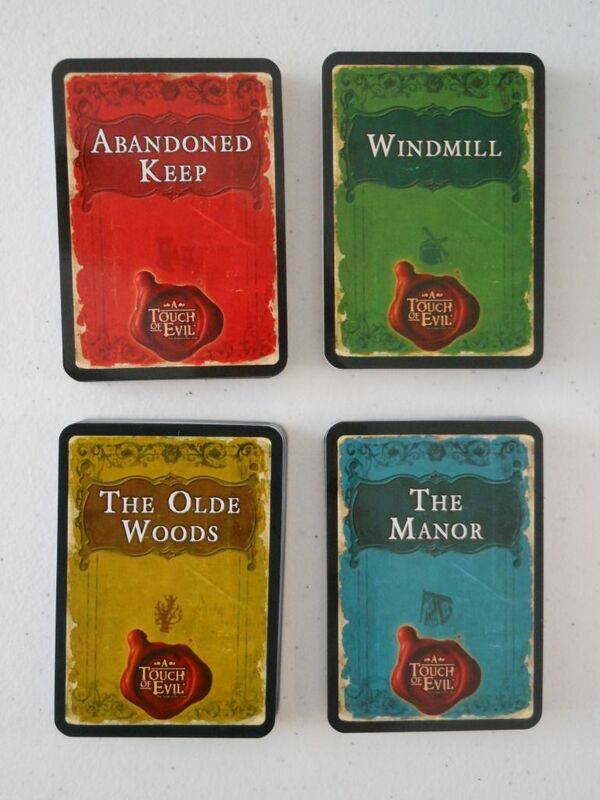 Once you have bought a lair card (which may cost as little as one token) and have bought a few items from the village shop, and you know the secrets of the elders, the tokens have no further use. You can’t use them in clever ways to get bonuses in combat, or to pick up some better weapons. In fact, the only way to get the best weapons is to explore and acquire them randomly from a draw pile. While we are talking about the mechanics of the game, it is worth mentioning that this game takes a lot of ideas from a lot of games (nothing wrong with that), but I don’t feel it implements any of them as well as it should. The game it most resembles is Talisman - you roll, move, sometimes do something based on an instruction on the board, sometimes draw a card, build up stats, acquire items and allies, and eventually feel strong enough to take on the bad guy. But it mixes that Talisman model with bits from Arkham Horror such as having specific decks of cards for specific locations. Talisman is good (not great) because of the variety of encounters you can have, but in this game there are only 20 encounters for each of the four main locations and no encounter cards for any other space on the board. This means you get some of what Talisman brings to the table, but not enough. The other spaces on the board only have very basic instructions (roll a dice, draw a card dependent on the result) and this just doesn’t bring enough excitement to the game. A selection of cards you might see if you can be bothered to leave town. The shadow track in the game is like the terror track in Arkham Horror, but with all the thrills taken out. In Arkham Horror, every time the terror track advances the players squirm. Bad stuff always happens. Shops shut, allies run away, monsters are everywhere. There really is a sense that things are getting bad and the end is nigh. In A Touch of Evil there are 20 spaces on the shadow track, and as the track advances there is no rising sense of panic. The players just shrug and then the next turn starts. In fact, as the track moves along, it gets easier to win the game! The cost of lair cards gets cheaper, which makes sense thematically, but actually encourages players to advance the track. It just doesn’t work for me. Never once, when playing this game, did I ever feel the threat of the villain as I do when playing Arkham Horror. The biggest issue I have with this game comes from believing things I read on BoardGameGeek. I should know by now that we are all geeks over there, and "easy" for us isn’t "easy" for other people. I read reviews saying this game could be "played by monkeys" it is so easy to learn. I love Arkham Horror, but I can’t find many people to play because it is fiddly. 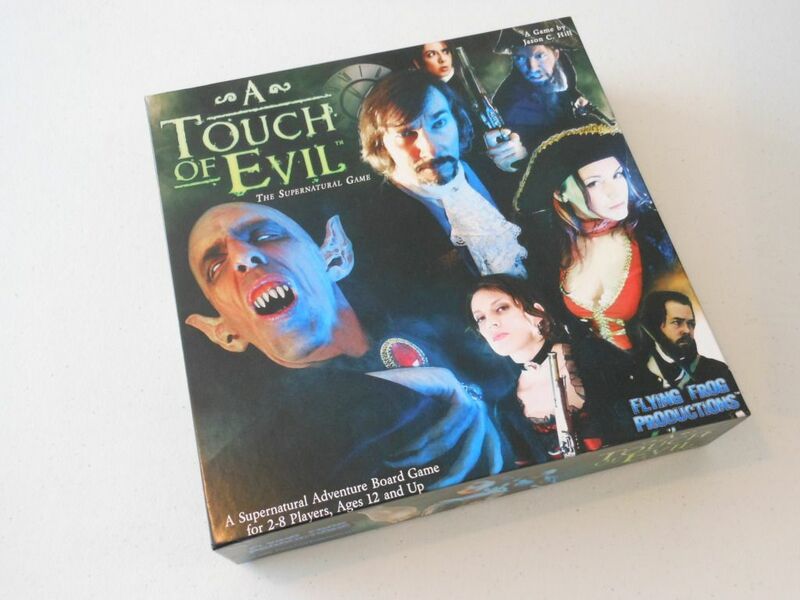 I bought A Touch of Evil believing it was Arkham Light - something I could get to the table all the time. Yes, A Touch of Evil is easier to learn than Arkham Horror; but it is by no means easy, and if anyone can train a monkey to play it I’ll shake him by the hand! The fundamental elements of the game are straight forward, but it is so fiddly. There are so many things to keep track of, so many different decks of cards, so many charts - the people I play games with just can’t cope with that. The stuff with the elders is relatively clever, but it’s fiddly. The powers of the villains are fiddly. The way all the cards interact is fiddly. Not fiddly for gamers, but fiddly for their friends! The game also seems to have lots of half-conceived ideas that just add extra complications for no good reason. A good example is the werewolf curse: If you happen to get bitten by the werewolf, you get a curse card. Every mystery phase you add a token to the card. 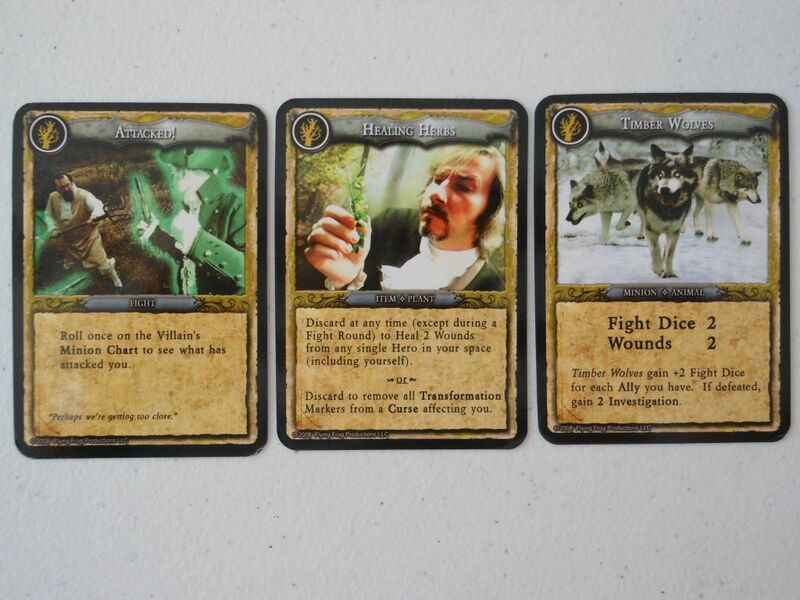 Once you have four tokens, you become a werewolf and... carry on the game as normal, except you make one attack on one hunter in every mystery phase. That just seems like a lot of bookkeeping for no real reason. Why couldn’t being a werewolf have other bonuses? Maybe it could reduce your honour, make it that you couldn’t have allies, allow you to sniff out the location of the bad guy? ANYTHING!! I mean, attacking the other players is actually a good thing in the standard, non co-operative game, so why would you even bother curing the curse? The rules - badly laid out, and in a strange font. I could go on, but this review is getting ridiculously long, and I just realised I forgot to mention something I loved about the game: the CD. I know, I know. Everybody hates the CD. I have read that people throw the CD away. But I like it. Okay, it’s not Mozart, but it is completely non-descript background music that isn’t going to interfere with the game, and that makes it perfect. It is just a load of plinky-plonky piano music, but it does set a mood that I felt was otherwise lacking from the game completely. The music incorporates some genuinely eerie sounds as well: There is often whispering in the background, and at one point some children start singing nursery rhymes. I thought it was a really good addition to the game. I want to finish up now. I really wanted to love this game. I love the FF boys, and I have much love for what they are trying to do, but I feel like this game is taking bits of other games but missing the heart that made those other games great. The theme is good, the playing pieces are nice, the quality of the tokens and the board is fantastic, the artwork is fun in a cheesy kind of way. The basic concept of the game is very simple to learn (basically roll and move) and if it was not for so many fiddly little rules and questions about how certain cards work it would be the perfect game for non-gamers. There are a few ideas that are good, such as the investigation tokens, but there are plenty of ideas that don't work well or seem half-baked. Not every game has to be a brainburner, and this game can't be accused of being that; but it just doesn't seem to be as much fun as it should be. It is worth noting there are three ways to play the game: Competitively, co-operatively, or in teams. This is a nice touch (no pun intended), but unfortunately the co-operative and team games seem tagged on. The game plays best as a competitive game where the players try to hinder rather than help each other, and this is the best way to play it. Overall, it's okay. This review may seem negative, but that's because there was potential for this game to be so much better than "okay." It just doesn't cut it for me. I know plenty of people really enjoy this game. I wish I did too. With the exception of a 2-hour play of "Heroes of Graxia" this was the worst gaming experience I ever had. We had one of the expansions and 7 players, and it was sheer torture for 3 or 4 hours before I gave my spot to another guy to end the misery. This is one of the worst games I've ever played; there are no meaningful decisions and everything you do takes all this fiddly die rolling, chart consulting, card shuffling, etc. It's horrid, and I will never play another game by this company because of it. And the so-called 'artwork' is just plain horrendous. I rate this game a 1, and mean it. I rated it about a 4, because I liked the theme and the artwork on the board (not on the cards!). I think what hurt the most was that, on paper, the game looked like such a good idea. It had such potential to be really fun. I still own the game, because my wife thought it was "okay," but it still hasn't been played for quite a while now. It is one of my biggest disappointments in gaming to date, due to the high expectations I had. I haven't played anything by Flying Frog since (nothing they have produced looks appealing to me), but I wouldn't completely rule it out. Thanks for checking in and posting. Review - Home You Go!